Finally, we have come to the conclusion of this 3 part series. This part focuses on user interactions and functionality of our portfolio. The upper sections of the page I will take you through inserting several plugins as well as custom jQuery code that will make our page alive. This includes a rotating slideshow, expanding and hiding sections and a modal view of images – also known as a “lightbox” effect. And to wrap it all up, we will add a small PHP snippet into our footer so we will have a working contact form. 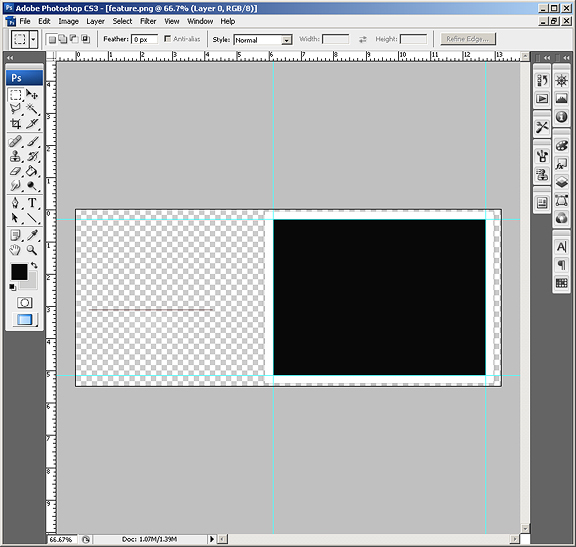 This tutorial is part 3 of three parts: 1) the Photoshop Mock up, 2) Coding the HTML / CSS and finally 3) Adding PHP / jQuery. Our feature section looks good as it is. Though it would be better if the large image on the right would change and cycle through other images. In other words, we need to convert it into a slideshow of our best work. Now that our scripts are intact, let’s get our images and our stylesheet ready so the animation will take place. 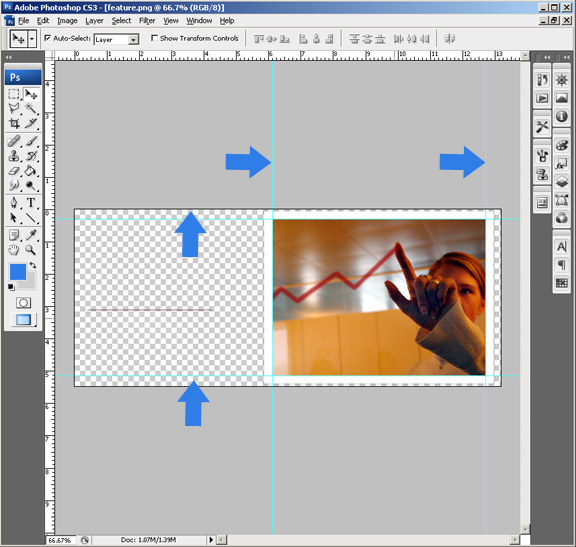 Open feature.png in Photoshop and create new guides as shown below. Make sure you cut right down to the pixel. Cut out the center image and fill with solid color. Save the file under the same name. Create several images that will go inside the slideshow – all must have the same dimensions – in our case: 476 pixels and 349 pixels. 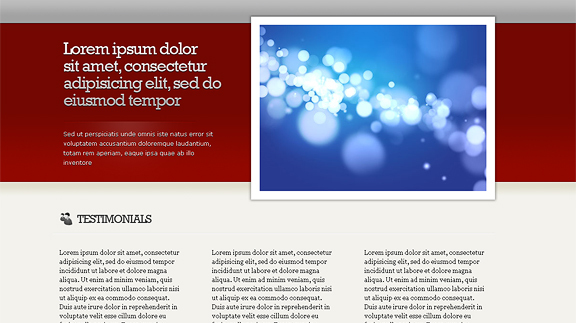 Next up: The expanding sections, and the “lightbox” effect. We have two sections below the fold that showcase what our work is all about. One is the useful “Testimonials” section – where visitors read what others are saying about our services. 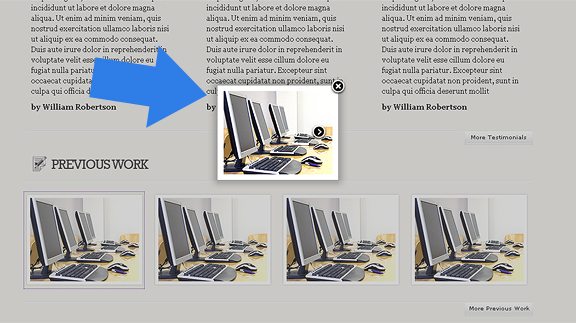 And of course, the “Previous Work” area – where you plug in screenshots of work that you’ve done. This may be websites, photographs, software; anything that can be screen captured you can apply. 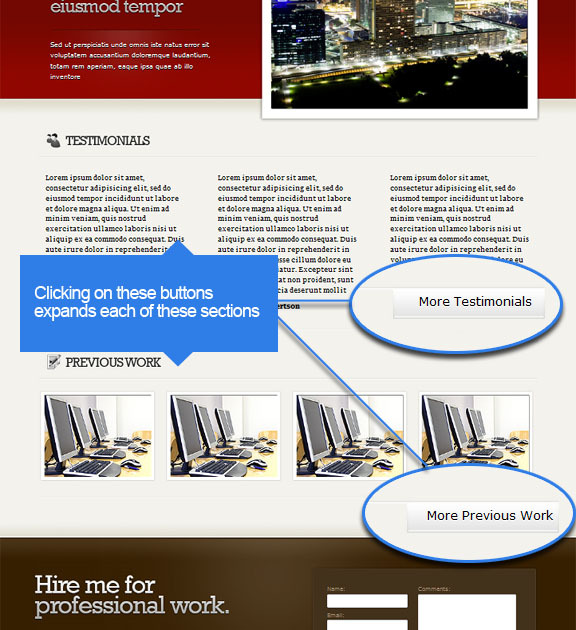 The point is to only show a few of testimonials, and a few thumbnails of your previous work. When visitors click on the “More” buttons, the section expands to show the rest. This approach is also best for people who have plenty of work, but only would like to show a little at first. The above code first hides our testimonial DIVS (that are greater than 3) and our previous work list items (that are greater than 4). 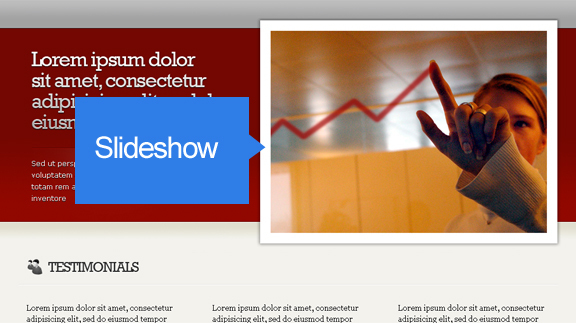 Then it alters the HTML of our buttons, as well as toggle our hidden sections to appear while sliding slowly. Last step: The contact form. First thing we have to do is change the extension of index.html to .php. We will be working with the .php file from now on. You can discard the .html version – or keep it for archive. 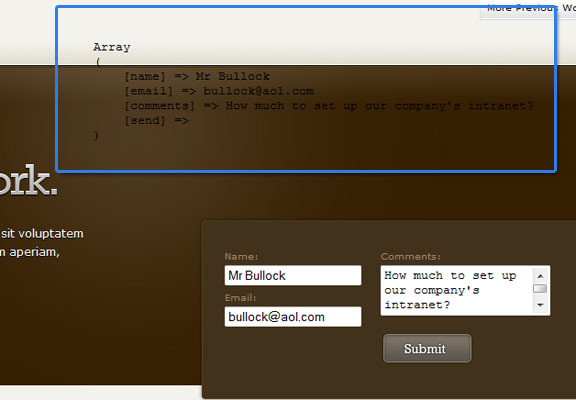 Look for the form tag inside index.php; add a method “post” and an action attribute. 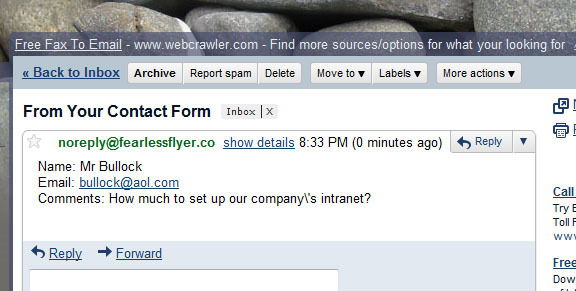 Now remember that this is a stripped down version of a contact form. You should seriously consider adding several things such as form validation and formatting the entries for safe and legitimate values. Also add error and success messages to let the user know what’s going on. (I won’t cover such things because as you can see – this tutorial has gone waaay too long). In closing, I hope that you may learn something from this 3 part series. 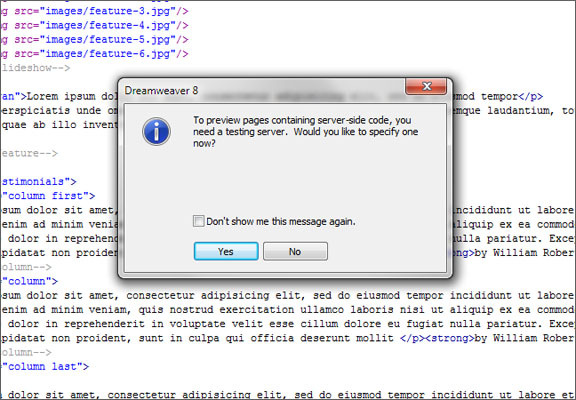 I also would like to thank the script and plugin developers which I included in this tutorial. You can download the finished product from this link, and of course view the live demo from here. You are AWESOME!, its like you knew what i needed, your like an angel from above, i love you, your like my new best friend and i will follow you like a disciple on facebook and twitter. Good day! I simply want to offer you a big thumbs up for your excellent information you have got right here on this post. post’s to be what precisely I’m looking for. Would you offer guest writers to write content in your case? I wouldn’t mind composing a post or elaborating on many of the subjects you write about here. Again, awesome web site! Thanks for sending out the emails. It is documented well and easy to read. wonder if you will take a step forward, and teach us how to turn it in a Word-press theme – landing page ! These steps are so helpful! I used them as a guide to design my one page portfolio! Glad to be of some help. Great portfolio you got going there! gr8, gonna try this one!